Maya Farlow learned the hard way to depend only on herself, so when she fell too deeply for the bad-boy charms of Del Mitchell, she did the only thing she could-she ran. Stunned, Del left Fool's Gold to make his name and fortune in extreme sports. Thrill Me is a definite keeper. Maya Farlow is happy to be back in Fool's Gold, especially with her new job working for the town, but having to work with her ex-fiance is not exactly what she was expecting. Maya last saw Del Mitchell ten years ago when she broke up with him and while she has regrets about how things went long ago, she knows she made the right choice. Or did she? She knows that working closely with Del is going to test her resolve severely. Del Mitchell thought he had everything ten years ago until Maya pulled the rug out from under his feet and he left Fool's Gold to explore the world. Now, even with his financial success and fame, he's not completely satisfied, but he'll take the summer to figure out what his next step would be while he works with Maya on the Mayor's campaign. Maya found home in Fool's Gold when her mother married a resident and the town adopted her as one of their own, but it wasn't always like that. Her mother always resented having her and never let her forget that she was a burden, so much that she didn't think she was lovable. Breaking up with Del was all about self-preservation and she choose to walk away from him before he left her. It's hard not to like Maya and her ambition, determination and tenacity. With the help of Fool's Gold, she made something of herself, but will she ever open herself up to love? Del always planned to leave Fool's Gold, but he thought Maya would be with him. He's ambitious, smart and driven - looking for the next frontier to conquer now that he's sold his company - but he's also mature enough to realize that maybe their break-up was for the best because of how immature the both were then and what a great team they make now. 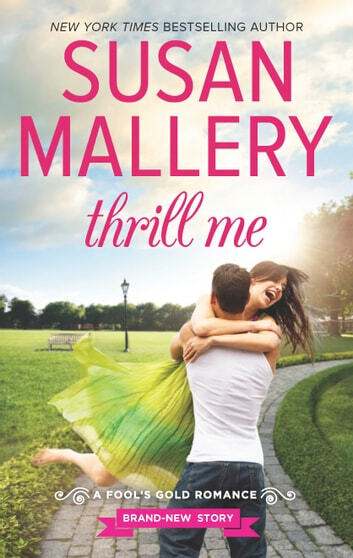 I have always enjoyed the Fool's Gold series because it has everything I love in my books: family, friendships, connections and continuity and THRILL ME definitely has all that. I really liked that Maya and Del did not play games about their feelings, they wanted each other and they went for it. They respected each other, found that they shared similar dreams to travel the world. Every encounter showed how much they had grown and how their past had shaped their present. Even Del's reaction to his dysfunctional family is different. Ten years ago he packed up and left and now he's trying to make amends and get along with his family. Beyond Maya and Del's relationship is the community in Fool's Gold. There is so much to love. Everyone is family, with people stepping up to support, help and provide for one another; meddling and manipulating (in a good way) and what would the town be without the sassy seniors - Eddie and Gladys? This is a heartwarming story with so many emotions - despair, hope, faith, love and I enjoyed every bit of it. Disclaimer: I received this book for free from the Publisher in exchange for an honest review. This does not affect my opinion of the book or the content of my review. 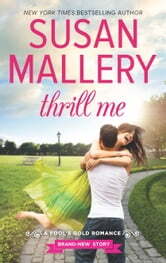 If you like romances where the hero and heroine had an unresolved past, you'll love Thrill Me! It's another book in the Fool's Gold series which involves a town full of rich characters and romance galore! I enjoyed seeing how the characters worked together while struggling with their past. Definitely worth adding to your book list - good, fun, light summer read. I just can't wait for another Fool's Gold story. Susan never fails to keep me engrossed in the storyline. Loved it.